Proud contributor to: Trust Inc. out today! About twelve years ago I became fascinated by trust – what builds it, how to measure it, what erodes it. Just over two years ago I wrote my major research paper on the key factors of inter-organizational trust for my masters degree. 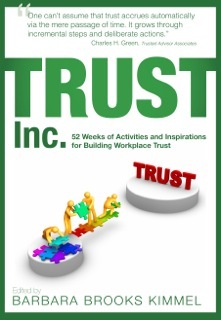 That research was the genesis of the Twelve Weeks to Trust blog series, an Ignite Guelph presentation and more recently, a contribution to Trust Inc: 52 Weeks of Activities & Inspirations for Building Workplace Trust. I’m so honoured to contribute to the publication which represents the efforts of dozens of experts… and me. If, like me, you believe that trust is the most important organizational strategy of the 21st century, if you believe we need to find macro strategies for macro trust problems, then I hope you’ll commit to incorporating at least one trust activity during the upcoming year. I ordered my copy tonight… can’t wait for it to arrive in my mailbox. To find out more about leading in trust and leading with trust, visit Trust Across America. Fantastic Dominique!!!! You are published! i will have to read this one and blog about it! Thanks Susan. That would be cool! Trust is a complex, but important issue. It is created over a series of truthful actions. It is critical in personal relationships as well as those of business. Many congrats, Dominique, for making a contribution to this critical issue!